A key component of Tourism Solomons’ ‘Solomon Is.’ rebrand strategy unveiled in July, Solomon Islands Minister for Culture & Tourism, the Hon. Bartholomew Parapolo has officially launched the national tourist office’s new consumer and corporate, industry focused websites. ictured at the official launch of the new Tourism Solomons’ ‘Solomon Is.’ websites, Minister for Culture & Tourism, the Hon. 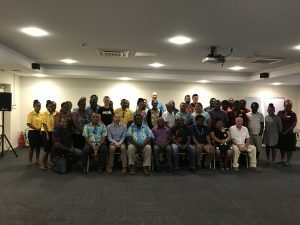 Bartholomew Parapolo (seated fifth from left) with government and tourism officials at the Heritage Park Hotel in Honiara. Located at www.visitsolomons.com.sb the new ‘Visit Solomons’ website has been specifically designed to allow visitors a plethora of information designed to provide them with everything they need to know about the Solomon Islands multi-faceted travel offerings. The new industry focused corporate website, https://tourismsolomons.com, contains a host of information principally created to provide travel agents, wholesalers and operators with the sales tools they need to effectively sell and package the destination. The new websites have been designed by Fiji-based Webmedia South Pacific.